Best known for his influential but short-lived proto-punk band the Modern Lovers, the weirdly wonderful Jonathan Richman spurned the electric guitars and driving rhythms of his early days in favour of gentler acoustic music. The man once known for his blithe drawl, progressive New York sound and wide-eyed wonder paid a well-attended visit to Toronto's Great Hall on Wednesday night (November 12), classical guitar in hand and drummer Tommy Larkins in tow. The famously magnanimous singer-songwriter sounded more like a traveling troubadour — singing in French, English, Spanish, Hebrew, etc. — than a father of punk rock. Often choosing Latin rhythms over the Velvet Underground drone of his early work, Richman sang songs that critics the world over refer to overwhelmingly as "child-like." It's a comparison that — upon seeing Jonathan Richman live — makes clear his enduring quality as a performer. Richman did come across as strikingly innocent during his set, singing songs about love, the sun, being nice to people and other things we all learn to take less seriously as we grow up, but that wide-eyed optimism, sincerity and wholesome sweetness has been in Richman's music all along — it's a big part of what set the Modern Lovers apart from their nihilistic counterparts in the mid '70s. The sense of communion, togetherness and generally nice stuff featured in Richman's songs Wednesday night has served as the over-riding constant of Richman's career. Strip down a Modern Lovers set to light percussion and classical guitar, and you've got Jonathan Richman in the 21st century. His set was a finger up the nose of those who subscribe to art only as the expression of tortured souls. As well as being overwhelmingly positive, Richman's songs were often as freewheeling as they were highfalutin. "Keith Richards," a barefaced tribute to the Rolling Stones guitarist, was a fan favourite, and won't be inspiring any classic rock "beefs" any time soon. "Take Me to the Plaza" was the last number before a two-song encore. The song was about Richman's need to be surrounded by normal, regular people — as opposed to cell phones and computers — as much as possible, as he claims not to own either; there are no screens in Jonathan Richman's world. The song was introduced in a rather timely fashion: Richman had attempted to step away from the microphone in order to talk to the audience more intimately, only for some intoxicated audience members in the back to start interrupting him, shouting song requests, asking him to strip his clothes off and who knows what else. Richman chalked it up to a lacking attention span due to television, cell phones and "those typewriters with the screen attached," then launched into "Take Me to the Plaza" in response. At times like these, Richman almost seemed part comedian, even if he's not trying to be. It's rarely clear whether he's trying to be anything at all, or everything at once. One crowd-pleaser in particular was 1992's "I Was Dancing in a Lesbian Bar," one of a few stripped-down party songs aimed at the uptight and non-inclusive folks who ruin them. It was one of many songs that climbed in and out of lyrical and instrumental improvisation, to great effect in this case. As he was quoted in Synthesis Weekly, "I don't write, really. I just make up songs." Richman's music has never been what one would call sophisticated, and to nobody's surprise it remained so at the Great Hall. Sometimes, the simplicity was a selling point — he could spit out whatever he wanted, often making up verses. He regularly attempted the always-daunting solo guitar solo, and it was unclear at times whether he was making some songs up as he went. He had an odd and enchanting habit of describing the meaning of his songs, only to reveal that the introduction also served as a word-for-word preview of all the lyrics, which rarely took long — there is nothing cryptic about Richman's lyricism. He says what he means, with no mincing of words. Richman's laissez-faire approach to musicality didn't always have the riveting affect it has when he's at his best, and the general lack of structure and guitar noodling could have benefitted from a little more direction, if not simply fewer occurrences, but as a lyricist, Richman is a singularity. He states things plainly, as they occur to him, without a filter. In that regard, he's sharp and incisive, never wasting words, and never waxing ambiguous. However, stating things as simply as Richman does, some of the songs may not have required the lengthy repetition he was all too willing to give them. 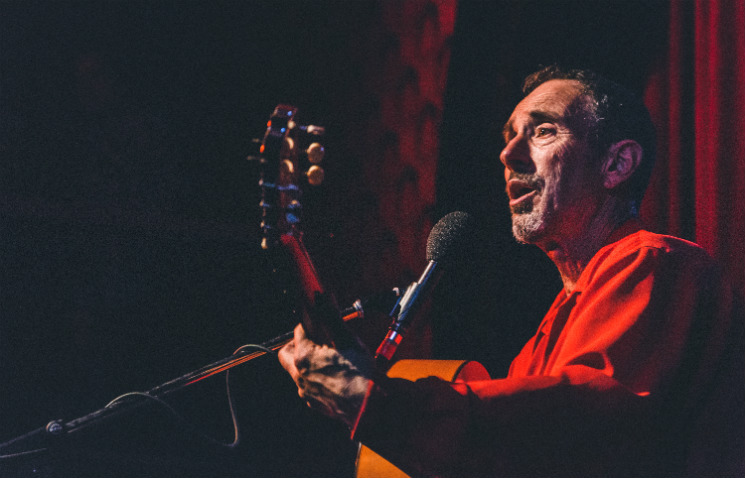 At 65, Jonathan Richman has retained a sense of wonder at the world around him. He moves to his own rhythm, doing only what he wants to. He didn't play any Modern Lovers songs, though some of the "Old World" themes remain present. He looked unreservedly happy to be playing live: He was animated, devoted, unorthodox and fun. Jonathan Richman is a one-of-a-kind performer with a big heart, incapable of being contrived or dishonest.